32-year-old Candian with a mind of her own/with (strong) grit and hunting for/with the courage for big challenges want to run the Mors 100 Miles. Ambition: Melissa Rose Irvine wants to overdue herself at the Mors 100 Miles. She has been a volunteer at a Brazilian orphanage. Put out forest fires in Canada and worked at an oilrig to earn money for new adventures in a life full of speed. So it is quite the adventurer who signed up for the Mors 100 Miles 2017 and who will be the first Canadian in the local ultra race this September. 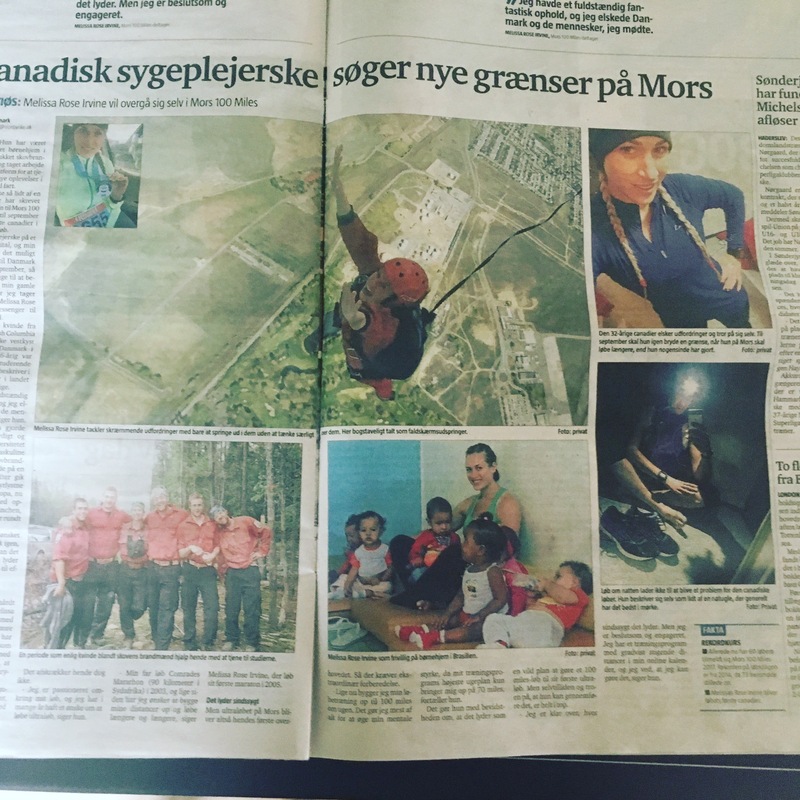 – I’m a nurse at a psychiatric hospital and my working schedule makes it possible for me to go to Denmark from September 6.-16., so I get a week to visit friends and my old host family before I return home, says Melissa Rose Irvine to Morsø Folkeblad via Messenger. The 32-year-old woman from Kamloops in British Columbia on the Canadian west coast knows Denmark already. At 16, she was an exchange student in Næstved and she describes her months in our country as absolutely wonderful. – I had an amazing stay and I loved Denmark and the people I met, she says. Back in Canada, she finished high school and earned money for college – among other things in masculine surroundings as a forest fire fighter and by working at an oilrig. Following that, the adventurous Canadian went back to Europe, now as a backpacker med stays in London, Munich, Paris – besides staying two weeks around Denmark. However, it will also be a tough return. True, Melissa Rose Irvine is a woman with strong grit/a mind of her own and hunting for big challenges. And true, she has broken several boundaries as a runner – among other things by running in weather that was so cold that her eyebrows formed ice crystals. But she has yet to reach distances comparable to Mors 100 Miles. It doesn’t terrify her, though. – I’m passionate about my running and for many years I had the wish to run an ultra race, she says. – My father ran the Comrades Marathon (90 km in Sourh Africa) in 2003 and ever since I have wanted to build up my distances and run further and further, says Melissa Rose Irvine, sho ran her first marathon in 2005. But the ultra race on Mors will be her first ever. So it calls for an extraordinary preparation. – Right now I’m building my running passes to reach 100 miles a week. Mostly, I do it to increase my mental strength, as my training schedule’s only brings me to 70 miles as the highest, she explains. She does this with the consciousness/knowledge that it sounds like a wild plan making a 100 miles race her first ultra race. But her confidence and the belief that she can complete are both strong. – I’m aware how crazy it sounds. But I’m determined and engaged. I have a training program with gradually increasing distances in my online calendar and I know that I can do it, she says. – 60 runners have already signed up for Mors 100 Miles 2017. The record on the race day is from 2014 when 73 attended/signed up. – Melissa Rose Irvine will be the first Canadian. Melissa Rose Irvine tackles frightening challenges by just jumping into them without thinking much about it. Here she literally falls as a skydiver. A period as single woman among the forest’s fire fighter helped her to earn for her studies. Melissa Rose Irvine as a volunteer at an orphanage in Brazil. The 32-year-old Canadian loves challenges and believes in herself. This September she once again will break a boundary when she on Mors will run further than she has ever run before. Nigh running doesn’t seem to become a problem for the Canadian runner. She describes herself as a bit of an night owl who generally feels best in the dark. Rules were made to be broken. How about ‘Golden’ rules such as never trying anything new on race day?